reading, or just watching the river go by. It is romantic for couples, fun for families, and perfect for divers. There are two bedrooms with king sized beds and a sleeper sofa, two bathrooms, and stocked kitchen with dishwasher and microwave. Game room with ping pong and foos ball, outdoor activities and a washer and dryer in the garage. Scott and Billie Rooney live on a farm outside of Live Oak, FL , about 35 miles from Paw Paw's Place. They grow blueberries and blackberries for U-Pick and have a flock of sheep and a few cattle. Originally from St. Petersburg, they moved to North Central Florida in 2005. We have been vacationing on the Suwannee River for many years. It is a great place for families to enjoy nature, connect with each other and just all around have fun. Paw Paw (Billie's dad) dearly loved this place. When he became ill, he needed to sell it and wanted it to stay in the family. We purchased it and have been renting it to vacationers since. He was proud to have so many families be able to experience the peacefulness and family fun that his family did over the years. There is nothing like having your morning coffee on the screened porch overlooking the slow moving water of the Suwannee River. Enjoy the peace and quiet as you watch the squirrels scurry through the trees, fish jump and see the occasional fisherman pass by. When you're up and ready to go, there are many springs nearby for swimming. You don't want to miss floating down the Ichetucknee River in a tube or on a raft. Canoe the Suwannee or bring your motor boat. Or just stay and home and fish off the dock or play in the water. Grill your supper and have an outdoor meal on the picnic table. Then end the evening with a campfire. Makes for a great nights sleep!! 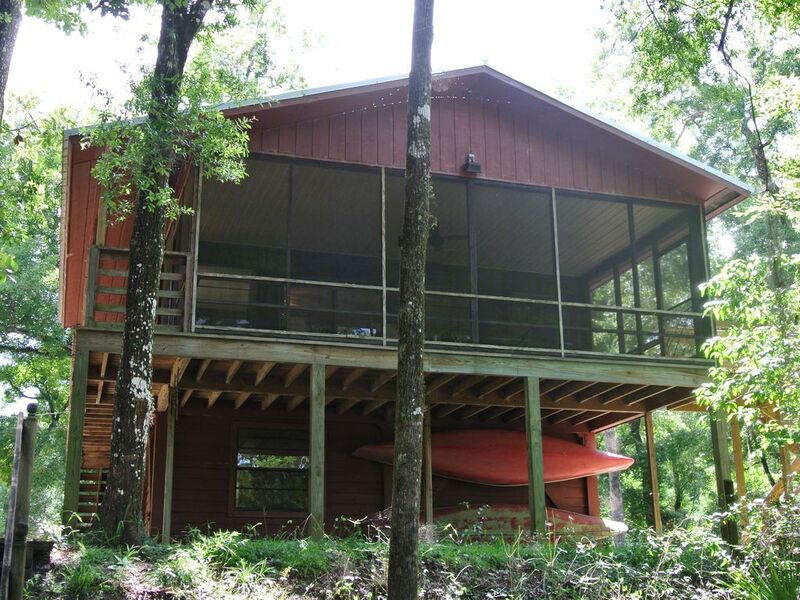 Located on a wooded acre and surrounded by nature. On the banks of the Historic Suwannee River. Floating dock and canoe. Screened porch overlooking the river. Dining table also on the porch. Ping pong and foos ball tables. Outdoor games - croquette, badminton, campfires allowed. Located on one wooded acre. Screened porch overlooking the Suwannee River. The house is built on stilts. Two bedrooms with king sized beds, sleeper sofa, two bathrooms, full kitchen, screen porch, Satellite TV/DVD, game room with ping pong and foosball, outdoor games, dock, and canoe. Outdoors grills. Campfires allowed. All types of water sports on the Suwannee, Santa Fe, and Ichetucknee Rivers, fishing, swim in Little River, Troy and other springs in the area, hike, bike on the Greenway, or just get away and relax! After reservation is made, you will receive an email with the Instructions, Driving Directions and Key Information.